If you love downhill skiing and skiing off piste, but hate the rush and crush, then you're ready to try ski touring. It needs an expert guide, and well planned routes to make it both safe and enjoyable. We'll sure you'll be converted! 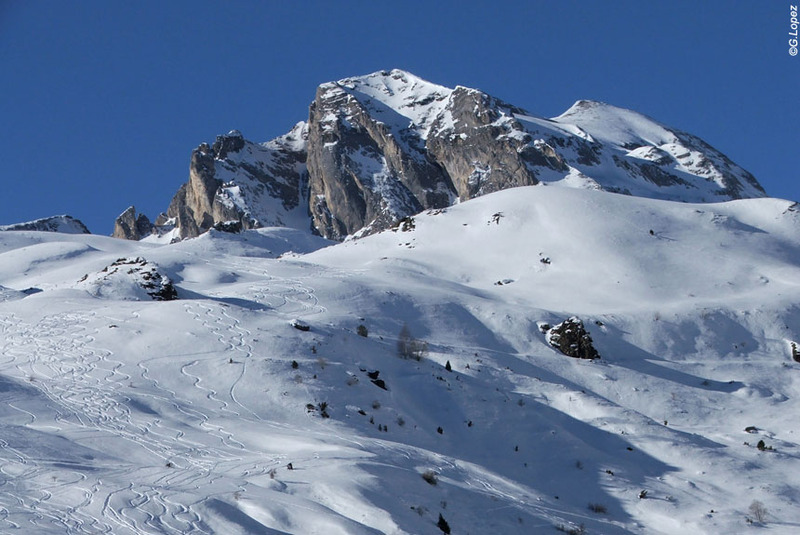 We meet you from the London-Lourdes flight on Saturday morning, and take you up to your mountain village hotel to check in, then you have your lesson, and first ski touring on easy tracks nearby. 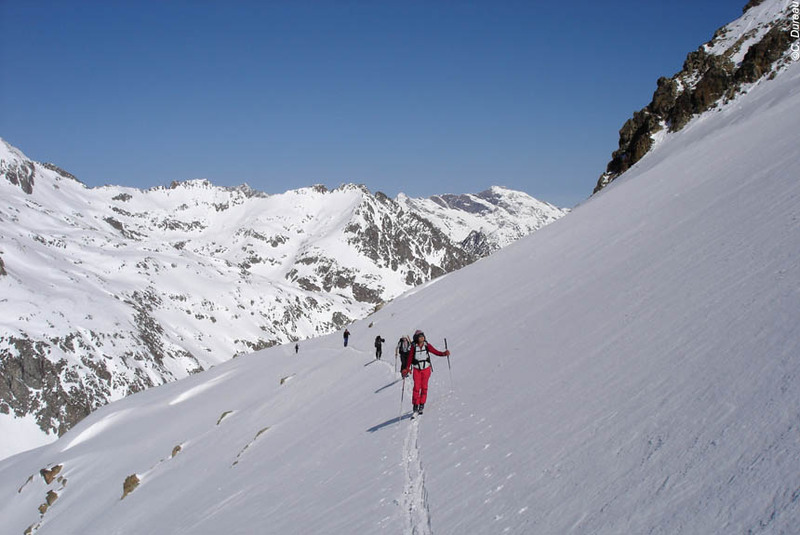 You then have two days of wonderful ski touring often on virgin snow discovering the real tranquillity and beauty of the snow covered Pyrenees as well as the UNESCO Heritage site of the Cirque de Gavarnie - the most stunning location in the whole of the Pyrenees. A weekend to remember! We meet you from the Saturday morning London-Lourdes flight to take you up into the Pyrenees, and your hotel. After checking in, and recuperation, your English speaking guide (he or she may be bilingual, but will certainly speak good conversational English) will first help you select the right equipment for you (included in the holiday price), and then give you your introductory lesson - not too difficult or demanding - and you will shortly be ski touring on nearby easy trails discovering for yourselves just how easy and enjoyable it can be with the right guide and routes. You stay in a comfortable, characterful 3 star hotel in the ski-oriented mountain village of Bareges, or, if not, the delightful spa town of Luz-Saint-Sauveur. We'll confirm which nearer the time. Today, we explore the wonderful mountain landscape all around the village of Bareges. Part of it has been sensitively developed for downhill skiing, and we use the cable cars to get higher up without any hard work. Then we explore using tracks especially suited to ski touring. We travel through the Lienz pine forest, and across what in summer are wildflower meadows, beside frozen streams and small waterfalls - natural ice sculptures|? 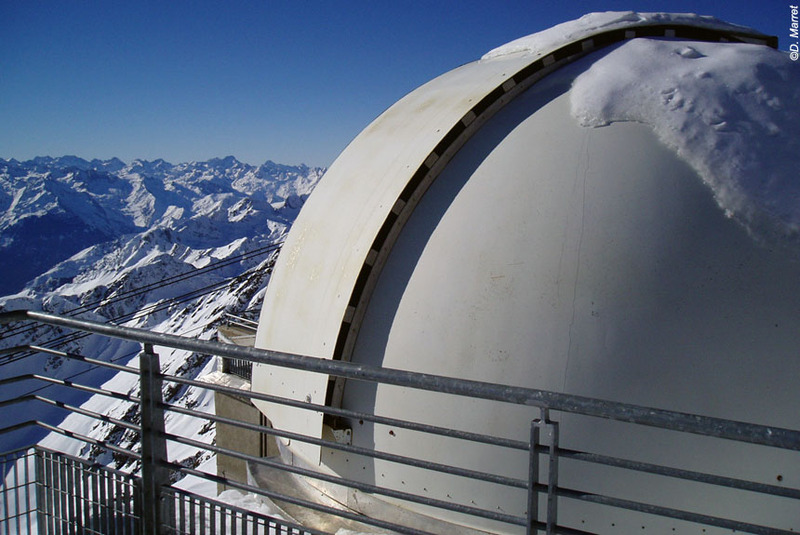 - all the time surrounded by the magnificent peaks including Tourmalet (its col made famous by the Tour de France), La Mongie and Quatre Termes before gently descending by way of the beautiful Aygues-Cluses valley. A one word description? Wow! Today is a day in what in French is called plein nature - full nature, or might be called (less poetically) total immersion in the natural surroundings. 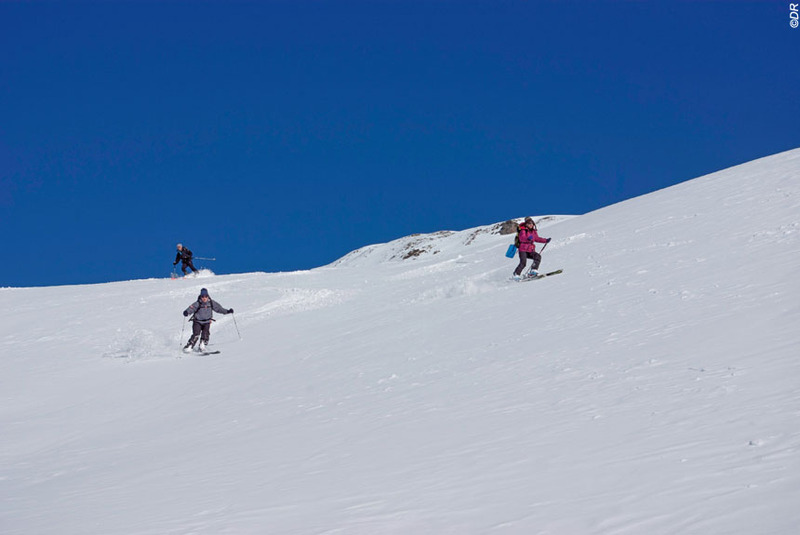 After a short transfer, you ski gently up to a col where you have the pleasure of a magnificent panorama across the UNESCO Heritage site of the Cirque de Gavarnie. Victor Hugo called it the colosseum of nature, an understatement when you stare wonderstruck at the 4,900 feet cliffs and 1,300 feet waterfall (the second largest in Europe) as well as numerous other frozen waterfalls. It makes you feel rather insignificant, but also privileged as it can only be visited in winter with a guide. 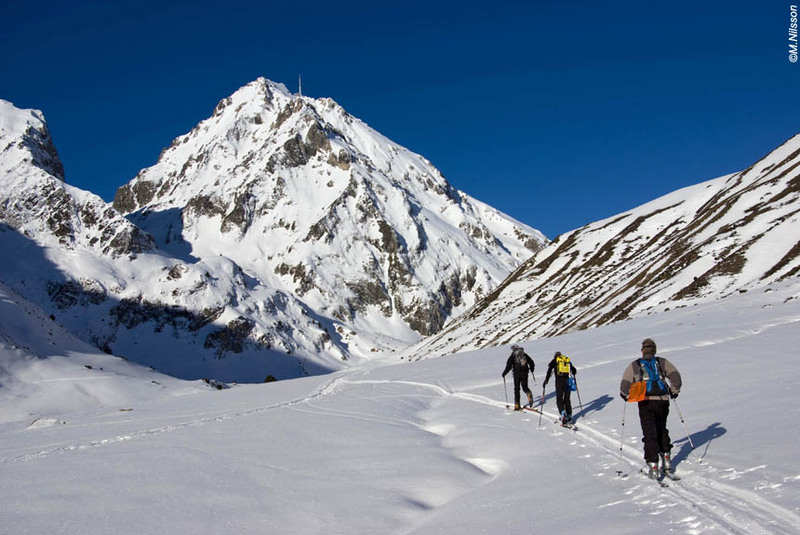 You continue on a route chosen by the guide depending on snow, weather conditions and the mood of the group. However, you can be sure you will be immersed in, and celebrating, unspoilt nature as you can enjoy every step of it with the time and energy to take photographs, and, well, drink it all in. After breakfast on Tuesday morning, sadly we have to take you to Tarbes-Lourdes airport in time to catch the mid-morning flight back to London. This holiday starts on Saturdays to coincide with the weekly flight from London Stansted to Lourdes - by far the lowest cost, fastest and most direct journey from the UK. We will meet the London flight, and take you to your hotel. We will then get you back to the airport in time for the Tuesday flight back to London. On the Tuesday at the end of the holiday, we will get you to Lourdes train station by 09.00, and Tarbes-Lourdes airport by 09.30 in time for the London flight. Each day the time spent on your ski touring journey will probably vary between 1 and 4 hours including rests etc, but your guide will respond to group preferences. The total daily ascent/descent is intended to be comfortable for anyone who can comfortably spend a morning or afternoon downhill skiing. You will often be able to choose between easier and more challenging routes to the next landmark. You only need carry a small rucksack for any personal items, extra clothing, camera etc. The hotel provides a picnic each full skiing day, which you will be expected to carry. The minimum group size is 5, and the maximum is 8. All participants will be English speakers. The qualified mountain guide will speak at least good conversational English, and may well be bi-lingual. The accommodation consists of three nights in a comfortable and characterful 3 star hotel with double or twin en suite room. The holiday includes three dinners and breakfasts. Picnic lunches are provided on day 2 and day 3, not on day 1 and day 4. Transfers are by minibus or taxi. 1 travel bag per person (or wheeled suitcase). Do not take too much luggage to avoid logistical issues for the transporter. On itinerant or semi-itinerant trips, also limit the weight of your travel bag to 10-12 kgs, as where there is difficult access to certain accommodation too much weight could jeopardize the delivery of your luggage. Do not leave fragile or valuable objects in your luggage. 1 rucksack of about 35-40 litres, with ventral waistband, wide shoulder straps and a well-ventilated back for your comfort. You must also be able to fix the skis to your rucksack. 1 large plastic bag to slip into your backpack to protect your belongings from the weather and / or rucksack cover. 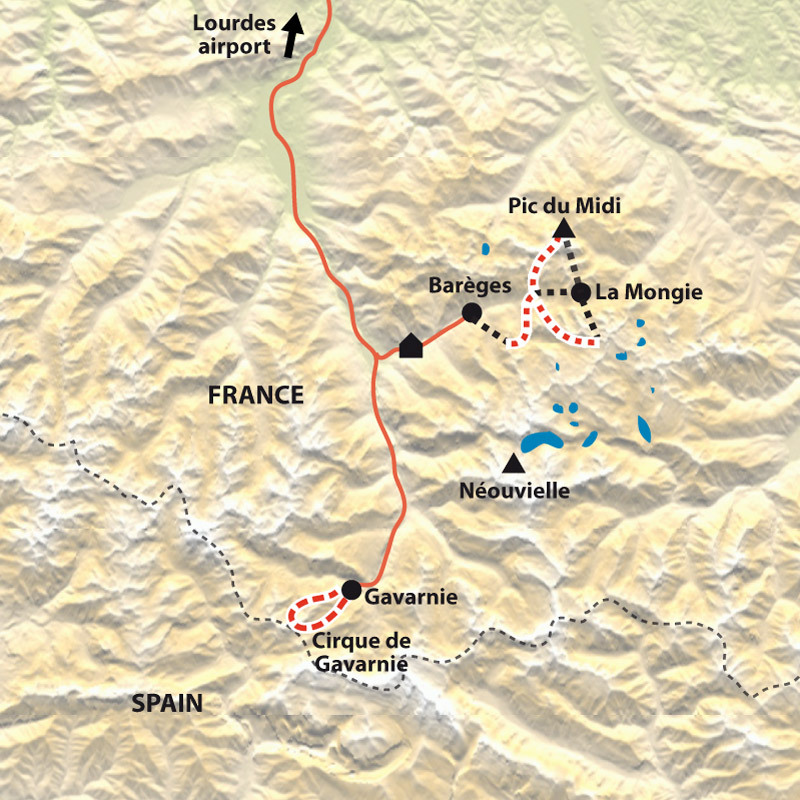 The ski touring equipment will be provided by Purely Pyrenees. In order for us to be able to supply you with the correct equipment please contact us at least a month before your departure date, specifying your height, your weight and your shoe size. We are currently updating the dates and prices of this trip. This information will be available soon. We can, if you wish, inform you by e-mail as soon as we have put this information online. Many thanks for your attention. We are committed to making sure you have all the information that is available for your holiday, but don't hesitate to contact our English speaking staff on +44(0) 207 859 4906 or +33(0) 562 977 201. All our walking holidays "Winter Walking"